I was about to leave when the phone rang one final time. Mr. Green had invited us to his abode. A description of his abode: it is lush green, a huge landscape, spanning acres; see in any direction, as far as the eyes can see and as far as the legs can take you, everything in the range and beyond, belongs to him. It is neither easy to get an invitation nor it is a cake-walk to reach his abode. As a pre-defined number of invitations are sent; it is mandatory to keep the count exact. That phone call was our final confirmation. The plan was to assemble at around 8pm. The invitees started assembling one after another. We started our journey once everyone reached. The journey was full of entertainment with lots of interactions. We had had a small dinner, which was followed by city/country words antyaksare (telling the name of a country or a city by the last alphabet of the previous name), and that was eventually followed by food antrakshree. Some out of this world combination of dishes, never heard of, were suggested. That turned out to be our litmus test. All hungry souls were desperately waiting for the dinner, and after that game, every second was killing them. Apart from a long hiccup on the way, the journey was mostly smooth. We reached kurangini by 10 or something, delayed by a few hours. 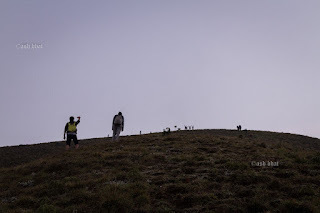 We couldn’t have completed this trek without a new group member, who was going to be with us for the next two days, Mr Manoj, our trek guide. A quiet lanky fellow. Mr. Green had its own requirements. On day one, we had to go on an arduous trek. Keeping this in mind, we quickly (somewhat) freshened up and had our breakfast. Our dear cool organisers elaborated us on the day’s plan. I was meekly observing them. Ankit pointed to a lone tree somewhere on the hill saying, “That is our lunch spot”. I couldn’t spot but said, “Oh! Cool”. Our trek started as planned. Manoj, Aman and I were in the lead. It was a nice opportunity to know Manoj. It was quite sunny. 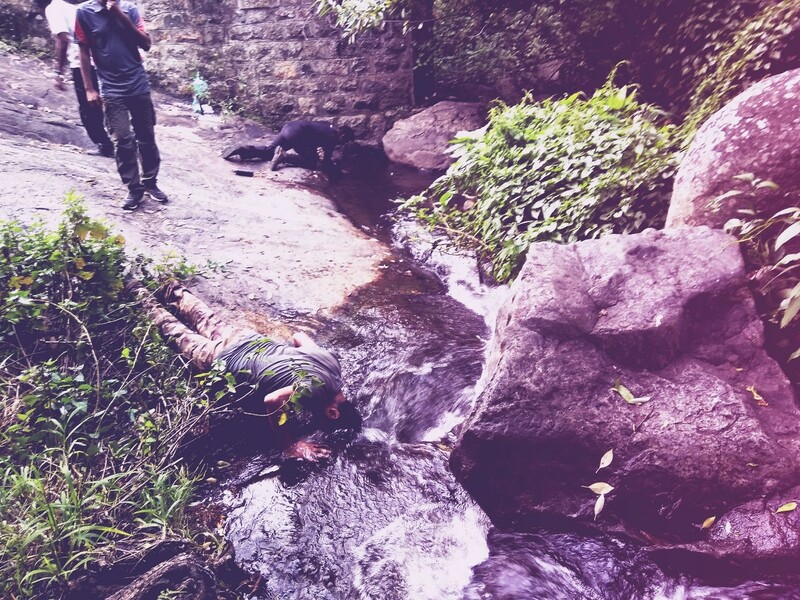 Shortly, we reached a stream. We filled our empty bottles and quenched our thirst. There wasn’t much shade on our trail. 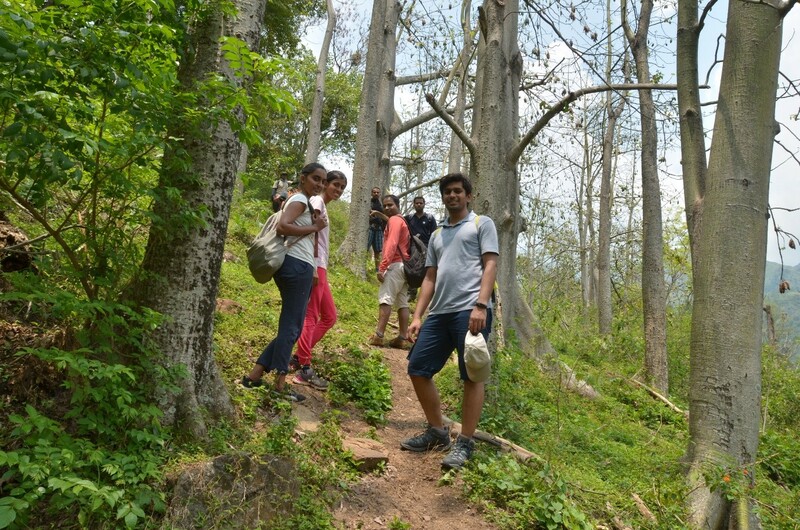 During the first half, till our lunch spot, we were trekking mostly in open, but for small patches of shades. Mr. Green had alerted us. The trek was going to be difficult. There would be scarcity of water. Clouds might not be our companion. In physically demanding conditions, it is difficult to have a full meal. At the single tree spot, we shared our meal and kept the unused packets for some another time. A much needed rest was taken. Till now, we had almost known everyone. The parallel hill was going to be our descend trail. Doesn’t it sound amazing! We would be descending from another hill altogether. I didn’t know then, it was going to be even more fascinating than it looked. After our meal, we started again to reach our camp-site. 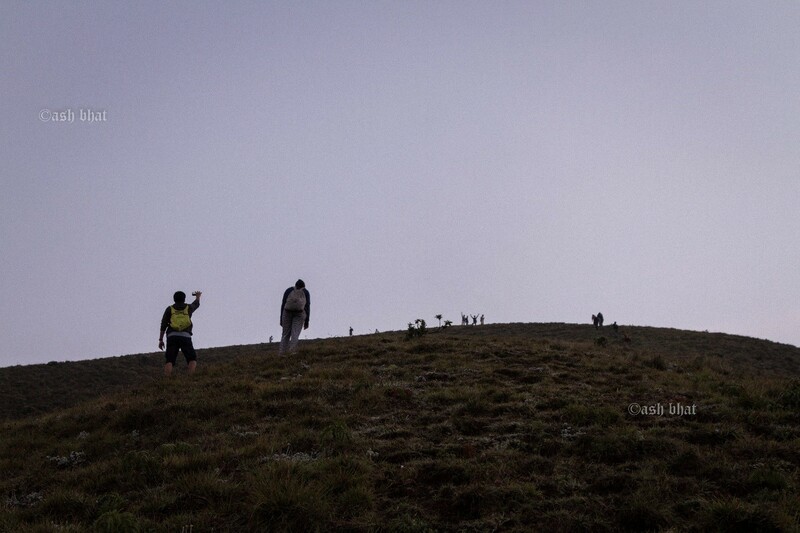 After around half an hour or so of our trek, the trail was covered with trees, and even clouds showed some mercy. The trail was damp. It was like a snake. There were regular curves after a certain distance. It was as if, we were walking on a huge innocuous snake. After covering a short distance, we found flowing water. I thought that it was impossible to fill bottles in that flow. Manoj showed his skills. He used a leaf to direct the water into our bottles. A cool example of resource utilization. It started raining. As we were in forest, we weren’t getting drenched. Manoj told us that we were only a thousand metre away from our camping location. Aiyyo! Where is tea plantation? Aman is fond of oranges. He was carrying a few. With diminishing hope of finding tea plantation, we thought of having oranges before moving ahead. Suddenly, a few of our fellas started shouting, “we reached; we reached!” We too started in hurry, but only after finishing oranges. Shhh! The moment we came out of the forest cover, we could see that the hill in front of us and beyond was full of tea plantation. We saw our stay location. A few of us including me ran till the stay location. We had reached Kolukkumalai. At our camping site, lemon tea was served, it was so refreshing. The tap water was cold. The weather was cool too, in fact it was cold for a few. We were at 2160mtr above sea-level. By chance, I got an opportunity to have a conversation with the estate manager. He showed me some priceless possessions. In the office, the ledger of 1930s are preserved. I used to hear stories of payments made during that period. That day, I saw record of those single digit salaries paid to employees. After dinner, it was time to sleep. Next day morning, we were supposed to start at 4am. Next day, we were supposed to meet Mr. Green. At 4am, the organizers elaborated the day’s plan over tea.Everyone was fresh after a good sleep. All energised, we started our trek. It was quite cold at dawn. After a short distance, we found a good number of plastic bottles gathered at a location. The people who stay there had gathered those bottles from different locations on the hill. Someone among us asked, “Who did it?” I thought, “Who else other than human beings are intelligent enough to leave thrash wherever they go!” We are probably in a race to leave plastic wherever possible! The trail wasn’t difficult, and with pleasant weather it was quite enjoyable. 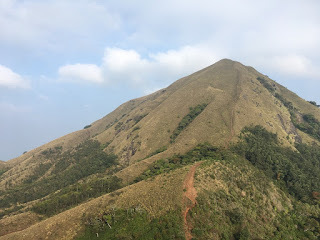 After trekking for about two hours, we had finally reached at the final base of Messapulimala, the second highest peak (2640mtr) in the southern part of India. The last stretch was steep. 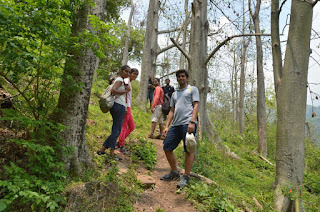 Manoj and Veera planned to take us through a zig-zag path, instead of the steep climb. It was planned to avoid sudden increase in altitude. A lot of us were enervated too. We were all climbing slowly on the last stretch. I was frequently looking in front and at the back to keep a track of our group. I was alone when his thoughts crossed my mind. He is an abstract now. I would never forget our interaction. Though, you will never be trekking with us in flesh, you will remain in my thoughts, always! Thanks for coming. We reached the peak, and I was under the impression we would be meeting Mr. Green here. We were proved wrong. Actually Mr. Green resides on Anamudi (2695mtr). 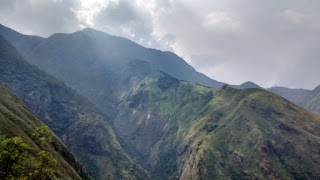 That is the highest peak in the southern part of India. It is out of bound for humans. And, if we don’t mend our ways soon, the day is not far when so many peaks will be out of bound for humans. In fact, the trend has started. We have to learn our lessons before nature rejects us! The peak was narrow and long. There were clouds around. The wind was strong and cool. We were all waiting for the sunrise. After spending a good amount of time at the peak, and relaxing a little we started to descend. On the way down, we took the steep path. We had to keep each and every step with care. That moment, when even a small pebble rolled down, someone used to shout. When we reached the final base and looked back, we had a feeling of a sense of accomplishment. We reached our camping site on the scheduled time. After breakfast, we had a planned sixty kilometre jeep ride to top station. Before leaving Kolukkumalai, a few of us had bought tea leaves. The amazing part of our jeep ride was that we had to start in Tamil Nadu, cross Kerala and then again reach Tamil Nadu. The first stretch of our ride was tumultuous. Throughout the stretch in tea estate, we were falling left or right or in front. Someone spelt a “sleeping-charm” in our jeep. Everyone excluding the driver was falling asleep. At one of the petrol pumps in Munnar, I exchanged my seat with another guy on the different jeep. Magic! Sleep was gone. Suddenly, I was laughing and enjoying. The driver was crazy. Those cuts at high speed, those screeching curves, and the music was enough to keep anyone high. Pooja was sitting on the front seat. She was a live example of a pendulum. Holding the overhead bar with one hand, she was moving left and right. We reached top-station and after a quick lunch, we started our final descend. The descend trail was not steep. It was a comfortable stretch bordered with lemon-grass. After chewing a few leaves, I felt like having lime juice. Somewhere on the trail, two among us were diligently involved in some technical discussions. I moved ahead to find some other companion. Ashwini started with some of her trek experiences, but don’t know when and why she started the topic of vegan. It was time for me to find someone else. 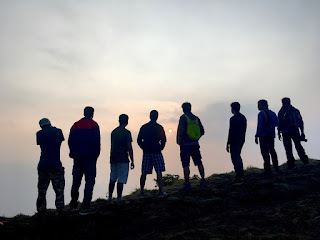 I started descending with Satish, my college senior. It was nostalgic! This way, chatting with different fellows at different locations, we were descending. On the way, we saw that single tree again, on the parallel hill.There was a stream on the way. The flowing-water sound was audible for some time now, and we were all looking forward to reach there. After relaxing for some fifteen to twenty minutes at the stream, the group moved ahead for the last leg of the final stretch. At Kurangini, before starting our journey back to Bengaluru, we had tea. In two days, we trekked 44km. It really gives a sense of achievement. Loaded with memories and with a promise to come back again we started our journey back to Bengaluru. Waiting for another invitation from Mr. Green! Hope we humans, mend our ways sooner than later!